Chaga mushroom tea has been used for thousands of years for as a healthy drink. The tea is made of Chaga fungus, which is rich in anti-oxidants that keep diseases at bay. The history of Chaga mushroom tea dates back to 100. BC, when Mon Shen Nong proclaimed Chaga as a superior class herb. Russians drank Chaga as a daily beverage just as we drink tea or coffee. The Chaga fungus grows on birch trees, and therefore it is also known as the “birch tree tea“, “birch fungus tea” or “birch tree fungus tea.” They are all the same, but one should not confuse these names with the birch gnarl. The benefits of Chaga tea come from the fungus, not the birch gnarl! It is made from the Chaga fungus, which is black on the outside, and a golden yellow-brown on the inside. The outer layer is strong and hard. The cell walls of Chaga are very tough and contain chitin. You need heat to crack through these cell walls. On this page, you will find answers to all of your questions about Chaga tea and much more. How to make Chaga mushroom tea? What are some Chaga tea recipes? 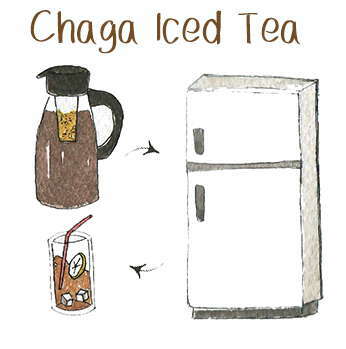 If you don’t know, how to make Chaga tea, don’t worry! It isn’t rocket science, but you need some patience and practice. The only ingredient needed for the Chaga mushroom tea is the Chaga itself. It can be raw, in dried chunks or powdered. If it’s a raw fungus, make sure it is dried at least a couple of weeks. PS! We only suggest some very best Chaga. Find them here on buying guide! We gonna show you from scratch, how to make Chaga mushroom tea. There are three main ways to do it: You can start making the tea from chunks or from powder – it’s up to your preferences. Each of the methods has its advantages and disadvantages. Put one spoon (or two, if you like the stronger taste) of ground Chaga powder. If you haven’t prepared the Chaga, you can just grind it. 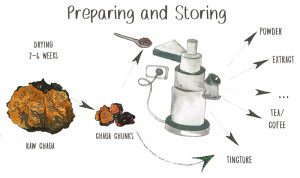 (You can also read about preparing Chaga below. Put something over the cup to keep the tea warm and let it steep for 5-10 minutes. 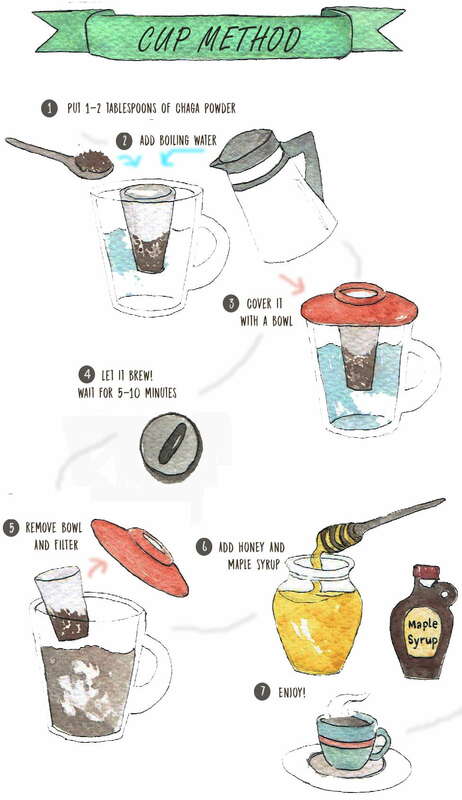 Add honey or maple syrup, sugar, milk, or any natural ingredient that you like can be added. You don’t get the most from the powder. By adding honey, the taste will get very smooth. Ginger will add a strong taste. By mixing them up, you’ll get an enjoyable and healthy Chaga drink that boosts your immune system and more. This fast and easy method is good enough for most people. You can easily mix up different combinations, proportions, and flavors. But what are the other ways to make Chaga tea? Place the Chaga chunks (not bigger than 1″ in size) or powder at the bottom of the pot. Measure 1-2 spoons of powder (or 1-2 chunks) for each person. Due to chitin cell walls, it is hard as a rock, so the long heating with this method helps break down these tough cell walls. The smaller the chunks the better, because smaller chunks have a relatively greater surface area, so you’ll get more of the ingredients into the tea. Preparation time: around 1.5-2 hours. By doing that, you’ll get a refreshing Chaga ice tea with health benefits. It’s good to drink it on hot summer days. It may take more time but it’s worth it on a hot summer day. So, those were Chaga mushroom tea recipes. I’d love to hear your feedback. If you know other recipes, let us know. How To Prepare The Chaga Tea? 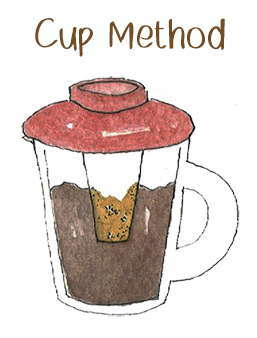 If you don’t have the powder or small chunks, then here’s a tutorial on how to prepare Chaga tea. In case you have raw Chaga, use an ax or a cleaver to cut it to smaller pieces (around 1-2″). It is easier to do it before it is completely dried. Typically Chaga will dry for month or two so don’t forget this before making Chaga mushroom tea. 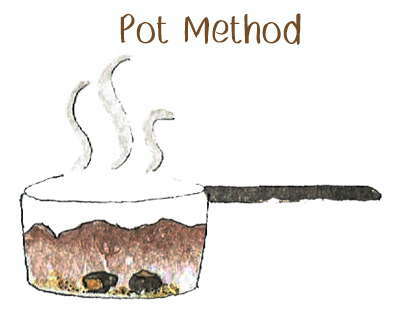 If you have smaller pieces cut, you can easily use the pot method described above. However, if you want to get the most of the Chaga for tea, you should use powdered Chaga. You’ll need a coffee bean grinder. Put the small chunks (the smaller the better!) into the grinder and grind it into a powder. Grinding in a coffee grinder works best when the Chaga is completely dried. If you want to get the most of the Chaga for tea, you should use powdered Chaga. Now you have prepared raw Chaga for tea. The benefits of Chaga tea are broad and significant – from strengthening the immune system to cures for disease. These are medically proven benefits. Because of the rich and diverse contents of Chaga, has a wide range of benefits. What does the Chaga contain? Polysaccharides/beta glucans – The main active substance of Chaga. Those are mushroom carbohydrates that increase energy levels and boost the functions of the brain and liver. Betulin/(ic) acid – A review by Królin in 2015 summarized the many studies on this substance as a promising cancer treatment. Studies have proven that it does no harm whatsoever to healthy cells. Phytosterols, inotodiols and lanosterols – These phytochemicals and phenols can stop the growth of harmful microbes. Melanin – The chemical substance that gives Chaga the highest antioxidant levels among all mushrooms. So, those are the ingredients that play a positive role in human health. Chaga is a real superfood with lots of benefits. It is erroneously thought that the Chaga and it’s tea are “alternative medicine” but the short answer is – it isn’t alternative medicine, but a medically proven herbal medicine whose effects have been heavily researched. Chaga mushroom tea can support the immune system, fight cancer, help you lose weight, keep the blood from clotting in the arteries, prevent ulcers, and gastritis, kill germs and fight viruses. Chaga contains lots of Beta-D-Glucans, which help to strengthen the body’s immune system. When needed, Chaga can help boost the immune system but slows it down, when it’s overactive. A study by Lull and collegues in 2005, showed that Chaga activates immune cells that combat cancer. This research is still underway because cancer is not a single disease, but very complex. More research is needed to determine the full range of the benefits of Chaga’s as a cancer treatment. PLEASE NOTE: Chaga101 isn’t saying that Chaga will cure cancer. If you have cancer, you should see a doctor. But there may be vital compounds in mushrooms that warrant further investigation into their cancer-fighting abilities. Yes, Chaga mushroom tea is rich in vitamins, minerals, and antioxidants. By combining these qualities with the tea’s side effect of reduced appetite, the results are moderate weight loss. Weight loss is all about consuming fewer calories than you burn. That’s how the tea works: you get a few good calories and feel full. Chaga inhibits platelet aggregation, and clotting of the arteries, assisting in blood circulation. These properties make Chaga helpful for those, who are suffering from pain, neuropathy, and diabetes, and may prevent heart attack and stroke. Studies have shown that one Chaga’s component – betulinic acid in Chaga can break down bad cholesterol. Source 1 and 2. Free radicals can damage DNA, and as we mentioned earlier, antioxidants can help reduce the damage from these nasty reactive chemicals. In 2004, Park and colleagues pre-treated cells with a Chaga mushroom extract, then treated them with H202 to induce oxidative stress. The cells pre-treated with Chaga extract displayed less damage than untreated cells. There are studies that have proven that Chaga can heal psoriasis. One started 75 years ago with 50 patients of different psoriasis types. Thirty-eight of them were completely cured. Eight showed improvement and only four patients of the 50 showed no improvement. There were no aggravations. There aren’t studies that show the negative effects of Chaga tea. However, as with anything, you need to be careful of uses that have never been studied. If you take medicines or are just sensitive to various side effects, you need to consider the side effects. In general, Chaga is safe without major side effects, but there might be some problems with those suffering from diabetes, autoimmune diseases, or taking blood thinners. And since not everything is yet researched, pregnant and breastfeeding women should be cautious. If you have your own Chaga tea recipes, feel free to share them with us so we can share them with the world. If you can, please send us pictures and step-by-step instructions. You can send your Chaga mushroom tea recipes from here. Chaga tea is tea made of birch tree fungus called Inonotus obliquus. To make the tea, you can use raw Chaga, chunks or ground powder. It’s full of healthy ingredients and you can harvest it by yourself for free! The Chaga mushroom tea taste is mild, sometimes with a slight hint of mushroom, or woody taste. There are several online shops that sell Chaga, but you want to make sure to get real, pure, wild Chaga. The chain from pickers to wholesale buyers to suppliers to buyers is long, and therefore you want to be sure about quality at every link in the chain. That’s why it’s crucial to do your homework before buying using this Chaga buying guide. This question is quite often asked and the short answer is – as much as you want. Like ordinary tea, there aren’t rules about how much you should or can drink. We like 1-3 cups per day. If you are feeling that you’re getting sick, drink it more often. However, if you’re pregnant, breastfeeding or having an auto-immune disease as shown in the side effects link and not to consume it. The tea is good for many things from strengthening the immune system to preventing and fighting cancer. You can read more about the Chaga benefits. There are many ways how to do it. You can read from here more. You can consume the tea hot or cold, made from chunks or powder, by boiling or seeping. However, you like it best. To get all the healthy components from Chaga, you must heat it to crack the chitinous cell walls, and free the ingredients. You can experiment with different flavors like honey, maple syrup or sugar. Why not add ginger, milk etc…? How to make use it for cancer? Actually, there’s nothing different about making and ordinary tea and tea for cancer. So check the regular recipes. Don’t self-medicate for cancer! You really need to consult a doctor. However, there are studies on the cancer-fighting abilities of Chaga, and it is a healthy drink to take while you work with your doctor. A little extra insurance won’t hurt. There are two ways to make it from chunks. First, you can put small chunks (about 1″ size; 1 or 2 chunks per person) at the bottom of a pot and let it simmer for half an hour (The Pot Method). Or you can grind dried chunks with a coffee bean grinder and prepare it as you would make tea in a cup. Where do I buy Chaga tea in Canada? Online! Amazon has a wide selection of Chaga products and delivers them all around the world. However, you need to be careful to ensure that the Chaga is pure and high quality. To read more, see the Chaga buying guide. 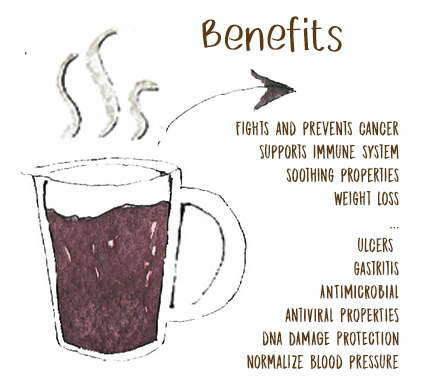 What is a Chaga Mushroom Coffee? Pretty much the same like ordinary coffee, but made of Chaga. Does the Chaga mushroom coffee have caffeine? No, since it’s not made of coffee beans, it doesn’t have caffeine. We hope this helped you learn about Chaga mushroom tea. It’s a good idea to make a habit of drinking Chaga tea. I’ve also read that many people have changed from drinking ordinary tea to it. If its better for you, why not? If you have any questions or suggestions, feel free to ask us via CONTACT. We are looking forward to publishing your Chaga tea recipes! I really want to make chaga tea but just like all the other web sites, no one has a complete recipe. How much water for how much chaga? Where is the ratio?